It was the early forties, and the world was at war. A young Chinese man sat in a Greenwich Village studio, philosophizing and dreaming with friends. Canaries, nightingales, and skylarks sang in birdcages. A candle flickered next to a human skull. A pipe dangling from his mouth, the young man spoke of a future when overpopulation would threaten the world as surely as the war then ravaging. In a time when soybeans were not even used as cattle fodder; he predicted they would become a world staple, with even soybean cocktail snacks popular in America. China would solve her problems, he said, and become a leading power and influence in the modern world. He saw acupuncture and herbal medicine and Chinese martial arts being widely practiced in the West. This young man was Yun Gee, an artist whose creative career was brief but inspired. Never able to enjoy wide acclaim or financial success, he left behind a legacy of sensitivity and brilliance for future generations to rediscover. Gee was born in 1906 on George Washington’s birthday in Ching On Li near Canton. His father lived in San Francisco for long periods of time, sending home enough money for his family. 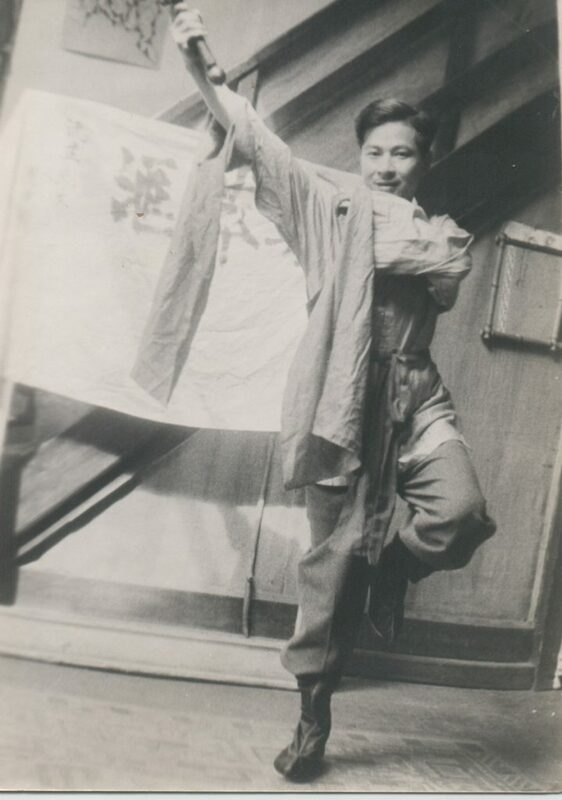 Gee’s education was rich in traditional Confucian concepts and broadened by Western ideas popularized after the 1911 revolution. Gee was perhaps as unorthodox in his thinking then, as he was later. At 13 he was expelled from school for writing an unacceptably non-traditional thesis about morality in China during the Three Kingdoms. Around the time of his expulsion, Gee studied traditional Chinese watercolors, choosing Kuan Yu, the warrior-saint of the Three Kingdoms, as the subject of his first painting. Gee came to San Francisco at the age of 15. Because his father claimed his citizenship papers were lost in the 1906 earthquake and fire, Gee was able to also claim citizenship. At first he probably lived with relatives near Chinatown, but he soon drifted to the bohemian fringes of North Beach. Gee became friends with Kenneth Rexroth, the American poet, and with many artists. He studied at the California School of Fine Arts for a few years with Otis Oldfield, recently returned from fifteen years in Paris and knowledgeable about the many new styles popular there. As a symbolic turning to modern art, Gee burned what he considered to be academic paintings in 1926. He also started a club for young Chinese painters called the Chinese Revolutionary Artists Club. Gee and Oldfield and several other artists jointly established in 1926 the Modern Gallery, a cooperative gallery which exhibited Gee’s paintings later that year in a one-man show. During his exhibition, Gee met his future patrons, the Prince and Princess Achille Murat. Greately impressed by Gee’s work, the Murats urged him to travel to Paris. With a small trunk of paintings, Gee, at 21, went to Paris in July of 1927. For the next three years, he was exposed to a dynamic city, full of changes and new ideas, artists and intellectuals. Gee met many prominent artists and intellectuals in the Murat’s salon, including Gertrude Stein. He also befriended Raymond Duncan, Isadora Duncan’s brother. In 1928 Gee visited Spain for 6 months, and his work of the time exhibits certain Spanish influences. The next year, after several smaller exhibitions, Gee had a widely-acclaimed one-man exhibition at the prominent Gallerie Bernheim-Jeune. Gee met his first wife, Paule de Reuss, a poet from a wealthy aristocratic family, at the Murats’ salon. Their marriage in 1930 so enraged her parents, that they completely disinherited her and left the couple to struggle on their own in the tight European economy. Although prolific, Gee’s works were often not well-received. The local art community preferred more realistic styles, and largely rejected the abstract mode popular in Europe and favored by Gee. The Depression further dampened money-making prospects. Gee finally realized that he would never be able to bring his wife Paule from France, where she still lived, disinherited and nearly starving. In 1932 he divorced her so that she could again be supported by her family. She never remarried and the tow of them continued to exchange letters every month of two for the next 30 years, until she committed suicide two years before his death. In 1933 Gee became severely depressed and stopped painting for two years. He did, however, give several recitals of Chinese music and dance. Gee was able to return to Paris in 1936, with Paule de Reusse continuing to encourage him and helping to arrange exhibitions for him. Gee painted a great amount during this second trip to Paris, but the rise of fascism and the outbreak of war forced him to return to New York in 1939. Gee continued painting and teaching in Greenwich Village. One afternoon, a YWCA art teacher who studied with him brought one of her students, Helen Wimmer, to his studio to meet him. While the YWCA teacher painted, Gee played Chinese musical instruments. Although only 16 at the time, Helen remembers this meeting as being love at first sight. Although her father initially disapproved, Helen Wimmer and Gee were married in 1942. Life for such an interracial couple in then-conservative New York often proved difficult. Helen recalls one time when the two of them were returning home from dinner in Chinatown, arm in arm, when a group of white thugs attacked them and beat up Gee. From then on, they did not walk or sit together in public. Notwithstanding such problems, Gee’s life in Greenwich Village during the forties was productive. He and his wife had many friends, and entertained often, and discussed the world’s future and its problems. His daughter, Li-lan, was born in 1943. The family continued living together on 10th Street until Gee’s complete breakdown in 1945. After that Helen and Li-lan moved a few blocks away to leave Gee to his own world. Li-lan remembers little of her father before his breakdown, and his schizophrenic state thereafter made it impossible for her to ever really get to know him. She did visit him every week or two, visits she did not particularly cherish. Yun Gee was self-sufficient and continued living in his studio until his death in 1963, from stomach cancer. Li-lan remembers his studio as being cluttered and full with paintings covering all the walls. Gee often set up paints for her to use while she visited, and tried to teach her Chinese, but she was not interested. Now an artist herself, with her first West Coast exhibit recently opened in Los Angeles at the Asher/Laure gallery, 8221 Santa Monica Boulevard, Li-lan visited China last January for 17 days with a group of artists. There she was able to visit her father’s home village, where his relatives had kept pictures of his grandmother and all the gallery announcements that he had sent back to them. They believed he would one day return and had not forgotten him.